I really had a swell time making Isabell Kraemer’s wrap, A Girl’s Best Friend. It was not hard, not boring, not slow, not annoying. It was the opposite of all these: easy, interesting, fast, and beautifully designed. And the yarn was a happy reunion for me. 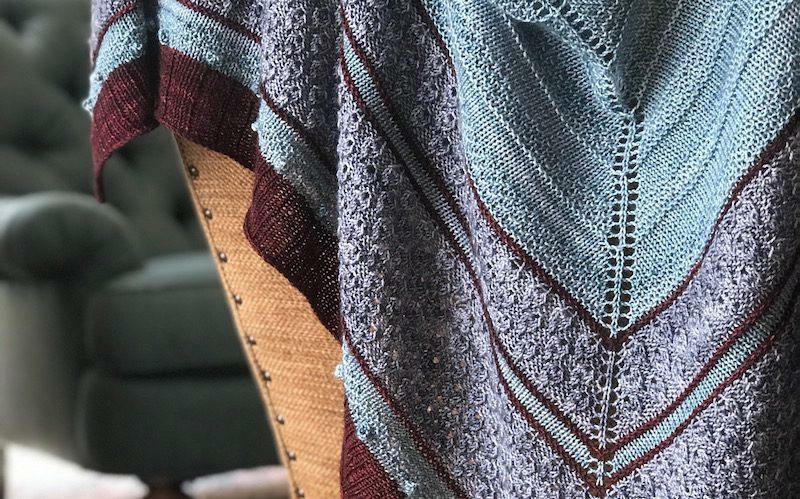 I’d made a Caitlin Hunter Birkin using Backyard Fiberworks Sock, so this was good fun to be back in the land of subtly shifting semi-solid colors. You can’t really see the watercolor effect of this yarn until you’ve worked a decent piece of it. Stitch markers. Sometimes stitch markers are not essential. Here, they were a welcome set of guideposts—wouldn’t have kept that center spine with its pair of yarnovers going without the markers reminding me. And that 3-stitch edge with its yarnover. The teardrop stitch. This is the challenge portion of your workout. To get the adorable little open mouth in the middle of the teardrop, you knit 5 into 1 stitch. Which means you’re turning a normal row into a giant row every once in a while, then decreasing it back to normal. It’s not a bobble. But it’s a cousin. Those skinny 2-row stripes. I love these. But I worried as I added them that I’d have trouble weaving in the ends without it being lumpen or otherwise unlovely. The BACKYARD FIBERWORKS colors here are Slate, Blue Jean Baby, and Wine Dark Sea. At the moment of weaving in the ends, I put both ends of the yarn onto one needle and wove the two ends in as if they were one. It is a little bulky, but it’s better to my eye than weaving each end in separately. The bobbles. This is a single row where Isabell clearly just thought, sure, why not: we’re doing bobbles now. I will say that it is not hard to do a bobble. But sometimes it’s a little too easy to overbobble and knit an extra row that turns a normal bobble into a superbobble. A perfect little tutorial in bobbling comes from Ysolda, whose “How to Knit a Bobble” is so satisfying. Thanks, Ysolda! The ends. I wove in the ends before blocking this—I left about an inch poking out to trim after blocking was finished. It just seemed like this superwash merino would hold onto the ends better after blocking. So far, so good. And the yarn? Already looking for my next wrap using this Backyard Fiberworks Sock. Sixteen colors? Gotta use ’em all. Only 11 to go now. I’d welcome suggestions for a superfun, multicolor wrap! I love it, but it does look like quite a project. I’ll save it for after Christmas. It has just the right proportion of Pay Attention and TV Knitting. Just when you hit your limit of teardrop stitch, guess what: you’re done! I made this too and I agree it was a joy to knit. Did you do pom poms? I am torn between pom poms and tassels. I’ve never made a tassel. Seems like a thing somebody should do. What colors did you use? I love it! Hi Susan–that’s Slate, Blue Jean Baby, and Wine Dark Sea. 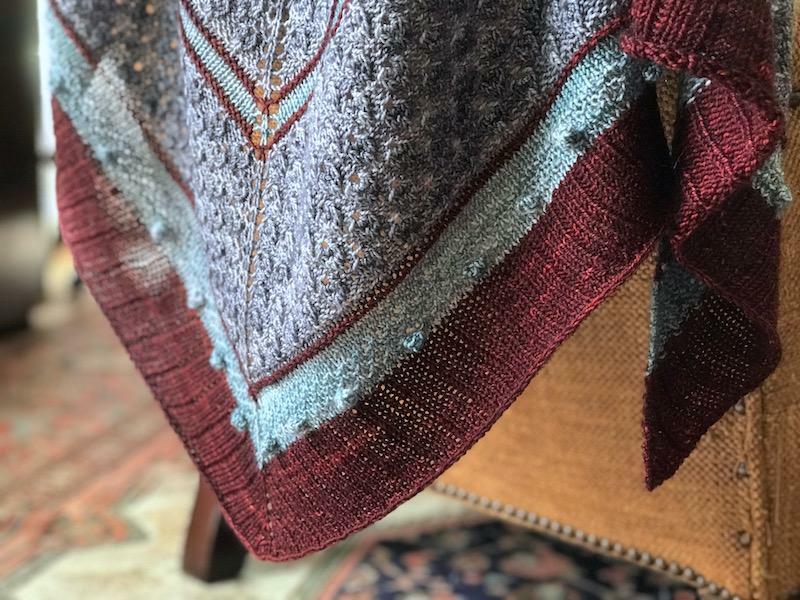 That teardrop stitch does look intriguing – thanks for making it sound easy to do 🙂 And I love the colors you chose for this. As usual! Thanks, Q. The 5 in 1 is definitely easy, yet at one point I had to go lie down. STAMINA. WHERE IS THE STAMINA? A thing of beauty, indeed. I loved knitting this wrap and I admit to being particularly chuffed at my own result. I, too, loved my fibers (Manos & Julie Asselin). Your colors are STUNNING! 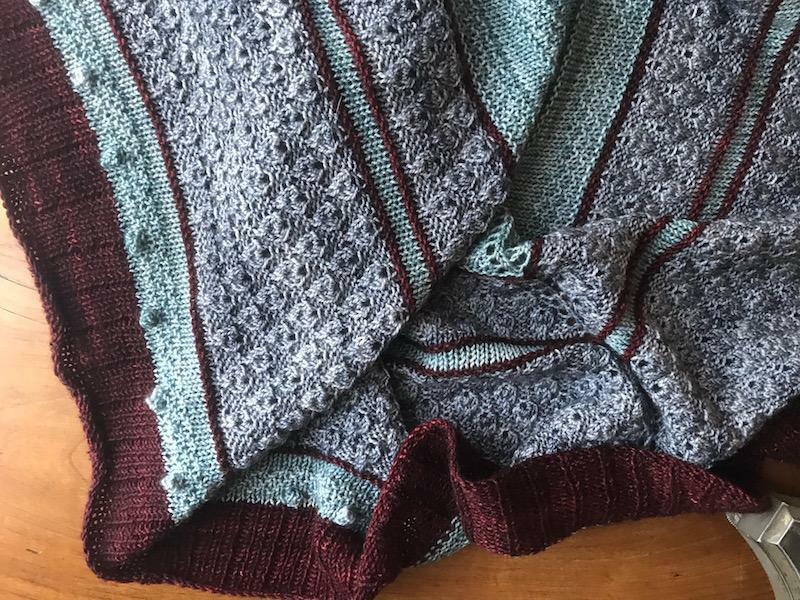 Will look for another pattern to use this exact color combo! 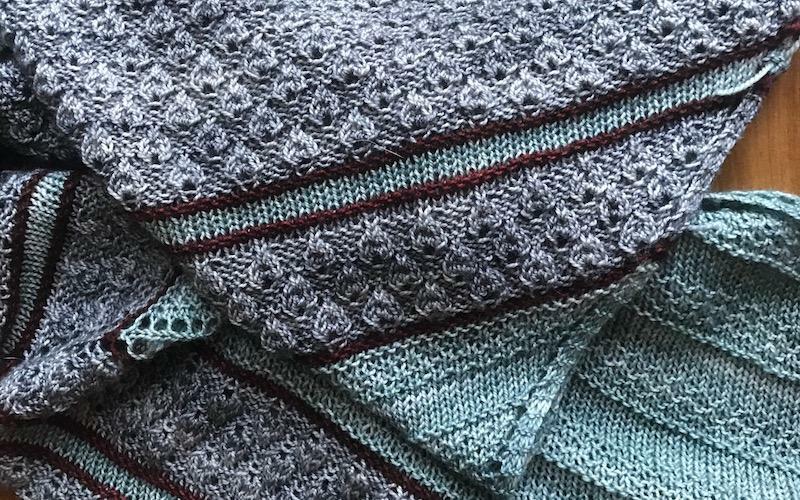 Would love to see yours–is it on Ravelry? Also: DID YOU POM POM? Gorgeous! 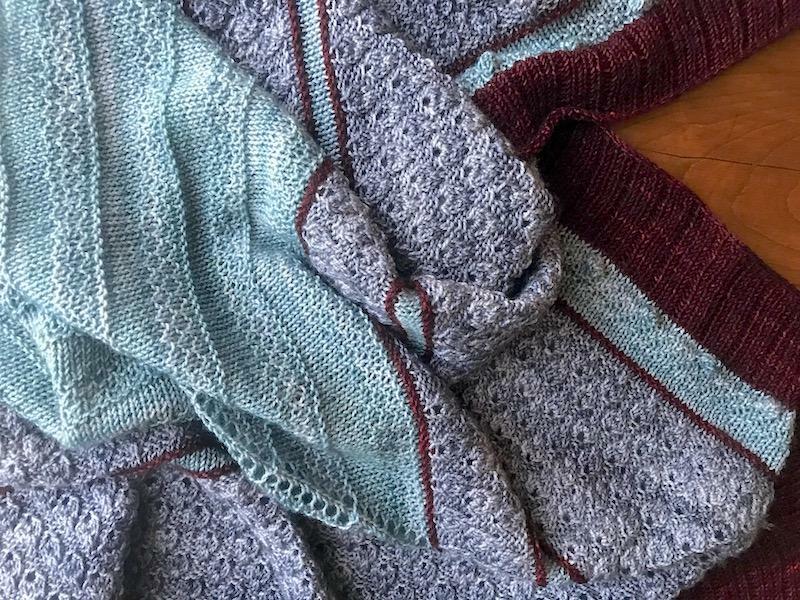 I love her designs – I’ve knit 2 of her sweaters, have all of them in my queue; her patterns are elegant yet straightforward. 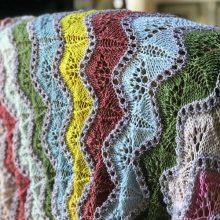 This wrap is in my queue too – your colors are lovely! Isabell’s sweaters are such a joy. Such a superfan. It wasn’t in my queue until I saw your version! So lovely! thanks for this post. loved your insights and bobble link. going to look more at that yarn—looks yummy! Just stunning . . . Hope you’re going to the opera soon! It looks like you left off the big bobbles on the edge. Yes, the pom poms! I haven’t decided whether to go with pom poms or the more dangly tassel idea. I’m kind of feeling tasselly these days. Decisions! 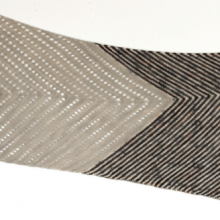 Also, one of my most favorite scarves is the Chevron Scarf by Sarah Hatton. I used up sock leftovers for this but it would be beautiful in this new yarn of yours. I highly recommend the 2nd Ave pattern by Amy Miller. Lots of fun color blocks and a great graphic look. I wear my 2nd Ave frequently. It was such a fun, soothing knit! I feel your Pom Pom angst deeply. The clear answer would be to make both Pom poms and tassels. Detachable of course. 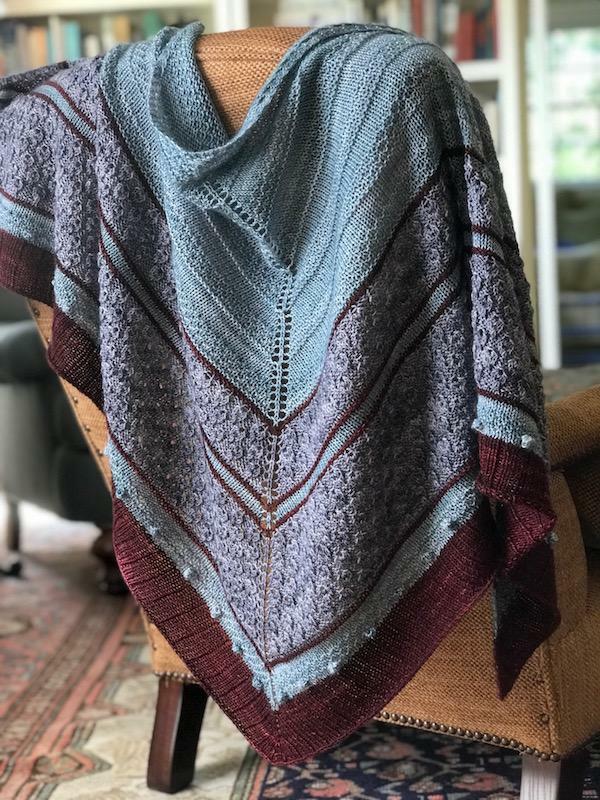 That shawl is just too gorgeous not to have multiple options. 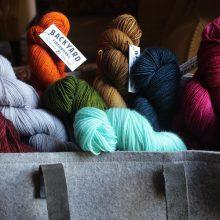 See you at Rhinebeck! OK you’re next-leveling this thing–I never thought about accessorizing a shawl. This changes everything. Rhinebeck is going to be so fun! Cannot WAIT. Yes, what a genius idea!!! It’s gorgeous! 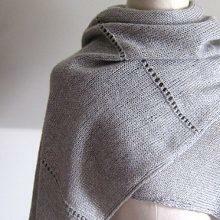 Just the right amount of texture variation…and still looks shawl-drapey. I do like a good pompom, but I’m thinking the tassels would be right here. Either way, you’ve made a winner! Of course I also just received my Knit Stars Freia Shawl balls from MDK and am hankering to cast on the Parallelogram wrap too. If only I were a quick knitter!! Is the purple-y color the “Slate”? Does it look more grey in your real life? 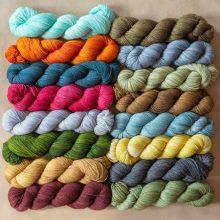 I would love to use that yarn but it is quite expensive to import it into Spain. Any substitution suggestion? Love love love the colors you have used! Steven B has some shawls that call for multi colors. Yours is lovely! I like the teardrop stitch better than a bobble. I will have to try it.